Last week I was walking out of South Station on my way to the temp assignment I’ve been working at for the last few months. Three young men were standing on bikes handing out leaflets for Hubway. I didn’t have time to chat with the young men so I grabbed the flyer and walked away. The flyer introduced Hubway to Bostonians. Joining online it allows you to access bicycles at Hubway’s 61 location. 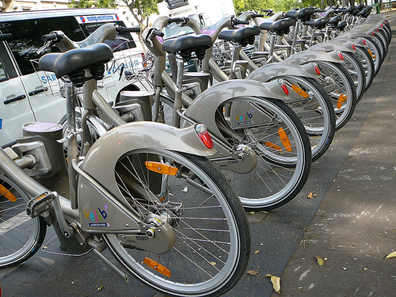 With 600 bikes to choose from, one is mailed a key after registartion which one uses to unlock a bike to use around the city. When done, one returns the bike to any of the Hubway stations. The idea came from Paris and Washington. I think it’s great Mayor Menino is taking the challenge seriously. Please take a minute to peruse the City of Boston’s website on its bicycle program. There are Hubway Stations throughout Boston but some areas of the city will be lacking access. Also, Cambridge and Somerville won’t have access right away. Hopefully this will change soon. So the next time you’re in Beantown, ride a bike around the city. This bike you won’t have to lug up to your fifth floor walkup apartment. Rather, you can put it back in a kiosk and let someone else enjoy the benefits of riding a bike around the city.